The country’s epic struggle to avert bankruptcy should have been settled when Athens received €110bn in aid – the biggest financial rescue programme in global history – from the EU and International Monetary Fund in May 2010. Instead, three bailouts later, it is still wrangling over the terms of the latest €86bn emergency loan package, with lenders also at loggerheads and diplomats no longer talking of a can, but rather a bomb, being kicked down the road. Default looms if a €7.4bn debt repayment – money owed mostly to the European Central Bank – is not honoured in July. Amid the uncertainty, volatility has returned to the markets. So, too, has fear, with an estimated €2.2bn being withdrawn from banks by panic-stricken depositors since the beginning of the year. With talk of Greece’s exit from the euro being heard again, farmers, trade unions and other sectors enraged by the eviscerating effects of austerity have once more come out in protest. This is the irony of Syriza, the leftwing party catapulted to power on a ticket to “tear up” the hated bailout accords widely blamed for extraordinary levels of Greek unemployment, poverty and emigration. Two years into office it has instead overseen the most punishing austerity measures to date, slashing public-sector salaries and pensions, cutting services, agreeing to the biggest privatisation programme in European history and raising taxes on everything from cars to beer – all of which has been the price of the loans that have kept default at bay and Greece in the euro. The arc of crisis that has swept the country – coursing like a cancer through its body politic, devastating its public health system, shattering lives – has been an exercise in the absurd. The feat of pulling off the greatest fiscal adjustment in modern times has spawned a slump longer and deeper than the Great Depression, with the Greek economy shrinking more than 25% since the crisis began. Even if the latest impasse is broken and a deal is reached with creditors soon, few believe that in a country of weak governance and institutions it will be easy to enforce. Political turbulence will almost certainly beckon; the prospect of “Grexit” will grow. Italy. A few months ago the centrist president, Matteo Renzi, resigned after losing a referendum (don’t bother with the details, they were never very interesting and in any event have been overtaken by events), making a new election necessary. There was a chance that Renzi would be returned to office, which would reset the clock on Italy’s inevitable descent into Greek-style chaos. But yesterday he resigned, throwing the upcoming elections into disarray and opening the door to eurosceptic populists. 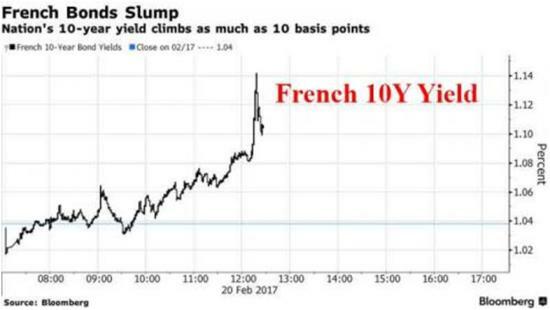 Combine political turmoil with a moribund banking system and Italy becomes a prime candidate for Big European Crisis of 2017. (MarketWatch) – Italy’s governing center-left Democratic Party was locked in a fierce battle Sunday over the best way to pull the country’s economy out of the doldrums and blunt the momentum of antiestablishment politicians—as mainstream politicians across the Continent struggle to come up with winning strategies in a year of major elections across the European Union. Former Prime Minister Matteo Renzi, who resigned as premier after losing a referendum vote on constitutional changes in December, formally stepped down as leader of the party after facing sharp criticism for his inability to stem the mounting popularity of the rival 5 Star Movement, a euroskeptic party that wants Italians to have a national vote on whether to leave the eurozone. 5 Star, which opposed Renzi’s proposals in the plebiscite, and the Democrats are running neck-and-neck in public-opinion polls. Both parties have pushed for fresh parliamentary elections this year. The country is now being run by a caretaker administration. 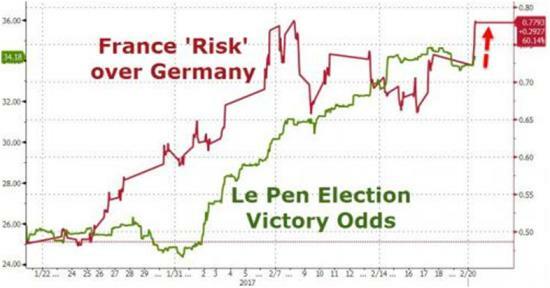 (Zero Hedge) – European political fears have returned this morning, leading to a blow out in French government bond yields, pushing the 10y yield now higher by 5bps and 5y up 8bps, as early losses extend after latest poll shows support for anti-euro presidential candidate Marine Le Pen rising in both election rounds. And those are just the front-burner problems. The Dutch are also holding general elections next month in which their version of Donald Trump will likely be the leading vote-getter. Germany has two elections this year, and opposition parties are gaining on Chancellor Angela Merkel. So there will be no shortage of scary headlines from the Continent going forward. Why should non-Europeans care about any of this? Because the EU is the biggest economic entity on the planet and the euro is the second most widely-held currency. Turmoil there means turmoil everywhere else, though the form is hard to predict. 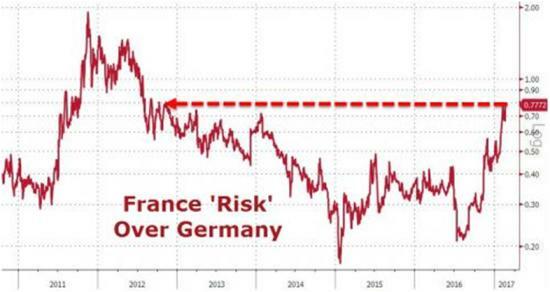 A euro crisis might send terrified capital into US stocks and bonds, extending the bull market in domestic financial assets – and making the current US administration look like a bunch of geniuses. Or it could spook capital out of financial assets altogether, crashing stocks and bonds while boosting the price of real things like farmland, solar farms and precious metals. Or it could buoy all US assets, with “anywhere but Europe” becoming the dominant investment theme for a while. OR the ECB could try to paper over the mess by devaluing the euro even further, setting off a trade war with the US, Japan and China, all of whom need weaker not stronger currencies to hide their own financial mismanagement.